Today Agent M took care of me. 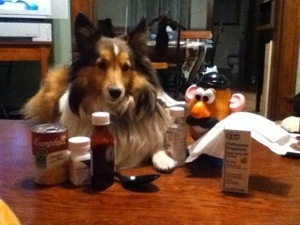 She made me chicken soup and brought me all my meds. She is such a great nurse. Hoping to feel better tomorrow….I can hope. This entry was tagged 365, blogging, fun, kid friendly, Mr. Potato Head, picture a day, sick. Bookmark the permalink.